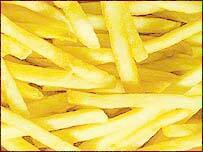 French fries are back on the menu in the US House of Representatives, three years after the name was ditched in favour of "freedom fries". House Republicans renamed fries and French toast in 2003 to protest at France's opposition to the war on Iraq. The patriotic name change hit the headlines at the time but the change back is getting much less coverage. 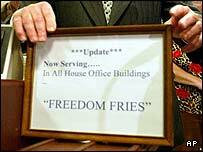 A House official would only say that fries are no longer being offered under the "freedom" nomenclature. The Washington Times newspaper contacted aides of the two congressmen behind the move to "freedom fries" to see if they could shed light on the change back. "We don't have a comment for your story," a spokeswoman for Republican representative Bob Ney told the newspaper. At the time, Mr Ney, who together with Walter Jones pushed for "freedom fries", said the action was "a small but symbolic effort to show the strong displeasure of many on Capitol Hill with the actions of our so-called ally, France". The move followed the lead of a North Carolina restaurant whose owner said he got the idea from similar protest action against Germany during World War I, when sauerkraut was renamed liberty cabbage and frankfurters became hot dogs. The switch to "freedom fries" was seen as reflecting the anti-French sentiment among some lawmakers who felt President Jacques Chirac betrayed the US by opposing its policy on Iraq. The Senate cafeterias never changed their menus. A spokeswoman for the French embassy asked about current French-US ties told the Washington Times that the two countries were working closely on the Middle East. "Our relations are much more important than potatoes," she said. "French fries are back on the menu in the Capitol, back on the presidential dinner menu and our relations are back on track."